- Fully air conditioned dorms of various sizes. 2. Check in not later than 10:00 pm. Great place - the owners are SO great - amazing customer service & they really listen to you & provide great advice - super humble & accommodating. The rooms are very clean! Good AC & fans in the room. Free replacement towels if you need 1 min from fullmoon festival **The place is one of the ONLY hostels that are completely legitimate and follow all the rules business wise so you can be assured This Is The Safest hostels on the Island** I will come back- full moon festival was epic! We stayed here for the full moon party. The room was good. Lock boxes are a bit small, and we only had 3 of them for 6 beds in our dorm. They can also easily fall off the wall. I'm assuming they will fix them soon. They allowed us to store bigger items such as laptops and iPads with them in their larger safe. The atmosphere was okay. They didn't really encourage any games or anything on the night of the full moon party, but we met some people in the small common area and played card games. Amazing location - only a 5 mins walk from full moon party. Amazing atmosphere because of large common area where guests play beer pong or chill with a beer in evenings. Staff is very friendly and provides great recommendations for nearby places. Minor downsides: Bed frames are made of steel so they make a lot of noise when people are trying to get on or off. Lockers are wooden and don't inspire much confidence. There are some bathrooms but need a few more considering the number of guests. Very clean and the staff was great! Only downside is that there’s only three bathrooms/showers for the whole hostel. Stayed there for full moon and it’s just a few minutes walk to the beach. Wonderful location! Great hostel and amazing location. Super close to full moon. Only a 5 min walk but far enough to get to sleep. Great and attentive hosts too. Beds are a bit uncomfy though and could do with a better bar. Stayed here for 3 days around New Years and was quite happy with the place. The staff are friendly and provide a decent free breakfast. The best part is being able to use a pool located about 500m away - it’s one of the most beautiful pools I’ve been to. Great located for the Full Moon Party and it’s close to the beach but not so close that it’s too loud. Downsides to this place are: only 3 toilets/showers, beds are the most uncomfortable ever, storage lockers are not large enough for backpacks. Edwin and his girlfriend were so helpful in organising things for us for the Full Moon party, couldn't have been more friendly. 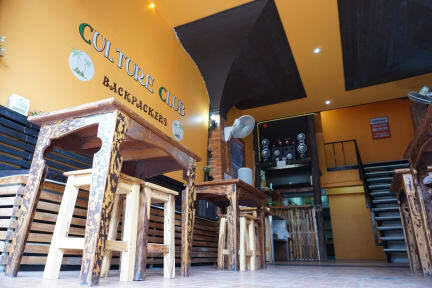 We booked at culture club paying the accurate price, however when we arrived we found out we were gonna be staying at another location with the same owners but that looked absolutely nothing like the pictures. We booked a 14 dorm room but it was actually a 20 dorm room. Location was great (next to full moon). Expensive for what it was however it was full moon so it is to be expected.